Choose a shaft and create a floorball stick according to your own ideas that will meet your needs. 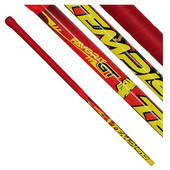 With a floorball blade and grip you get an unique stick design. Be careful - shaft and blade be the same brand (according to the IFF regulation). Before you choose the stick, we recommend you to read a buying tips, which can advise you what length, hardness and shaft material to choose, we can also help you with the right choice of the blade bends. We believe that tempting offer to create a stick according to your wishes will captivate you and you will be satisfied with the new stick!